Benefits include reducing the layer of abdominal fat. Our dietary weight loss supplement Viscerox™ is formulated from a patented extract of licorice root, also known by its botanical name, Glycyrrhiza glabra. A perennial plant that grows in Southern Europe and Asia, licorice is widely-used in Chinese traditional medicine. Its therapeutic use actually dates back centuries to ancient times. While licorice is known for its distinctive taste, it is the plant’s roots, or rhizomes, which are of interest to the scientific community. Researchers have identified several active principles as being responsible for licorice root’s health benefits: glycyrrhizic acid and bioactive flavonoids such as glabridin, liquiritoside and isoliquiritoside. Some of these substances are known in particular for their ability to combat oxidative stress but in addition to their antioxidant properties, these active principles confer numerous therapeutic benefits on licorice root. This is why the licorice root plant has been traditionally used to treat a number of disorders such as certain skin diseases and digestive problems. As a result of the many health benefits of licorice root, it has been the subject of numerous scientific studies. These have confirmed its antioxidant potency which may play a role in various enzymatic pathways. Certain of licorice root’s active principles may, for example, help regulate enzymatic pathways in the liver, as well as reduce both the amount of fat stored by the body and oxidation of LDL-cholesterol. That’s why licorice root is often described as a fat burner or as having effects on weight loss. Studies have found ingestion of licorice root extract to be associated with reduced body fat, reduced weight gain, and reduced accumulation of abdominal fat as well as with lower blood sugar levels. Drawing on these results, Viscerox™ has been specially formulated to offer a fat-burning formulation of unprecedented efficacy. 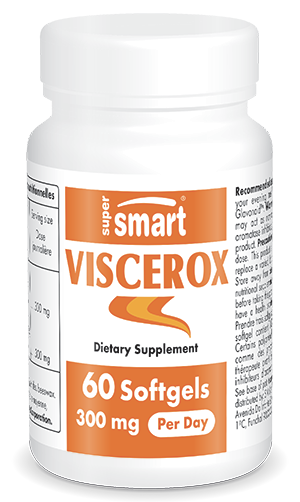 While there are multiple licorice root benefits, Viscerox™ is specially formulated to target the abdominal fat layer. The body actually has different types of fat including the abdominal fat situated under the abdominal muscles and which surrounds our vital organs. While accumulation of fat may be considered aesthetically unattractive, abdominal fat can actually have adverse effects on our health, including triggering the first signs of metabolic syndrome. This is a collection of symptoms that potentially precede the development of health problems such as cardiovascular disease or type 2 diabetes. Our Viscerox™ licorice root supplement specifically targets the accumulation of abdominal fat. Our abdominal fat-reduction formulation Viscerox™ is composed of a patented, concentrated extract of licorice root. Each capsule contains 100mg of Glavonoid, an oil extract derived from licorice root, or Glycyrrhiza glabra, and is very well-tolerated by the body. It is contraindicated only for individuals taking aromatase inhibitor-based treatments. The suggested dose is three capsules a day, to be taken with meals, for a minimum of six to eight weeks. For optimal efficacy, Viscerox™ supplementation can be accompanied by a slimming diet in which case advice should be sought from your therapist to determine the best options for achieving weight loss. Adults. Take three softgels a day with dinner in the evening, or as advised by your therapist. Each softgel contains 100 mg of Glavonoid™, an oil extract of Glycyrrhiza glabra standardised to provide 30% polyphenols and 3% glabridin. Warning : as certain polyphenols such as glabridin mimic phytooestrogens, consult your therapist before using if you take aromatase inhibitors.